For nearly two decades, the Toyota Prius has been sitting atop the throne of the midsize hybrid sedan segment. Hyundai thought it was about time for a change, so they built an electrified game-changer of their own, the Ioniq Hybrid. We’ve already shown you how it measures up the Prius, but what about other hybrid sedans on the market, like Kia’s entry for instance? We thought we’d show you by comparing the 2018 Hyundai Ioniq Hybrid vs 2018 Kia Optima Hybrid. 26.5 cu. ft. Cargo Capacity 13.4 cu. ft.
We’re not trying to say that the Optima Hybrid doesn’t do its job, we’re sure it’s much more efficient than the conventional Kia Optima. But compared to the Ioniq Hybrid, it’s a no brainer – the Hyundai is going to save you much more money at the gas pump, and leave a much smaller footprint on the environment. How so? Well, just glance at the top two rows in the table above. 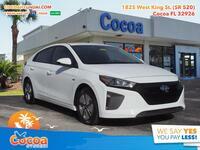 On a single gallon of gas, the Ioniq can travel 18 miles further than the Optima inside the city. On the highway? 13 miles. Those numbers are hard to argue with. Of course, the Optima Hybrid does have an advantage of its own. While the Ioniq Hybrid tries not to skimp on power, being that much less efficient certainly leads to a boost in power, which is obvious here at the Kia hybrid vehicle offers an extra 53 horsepower. But the Hyundai Ioniq Hybrid isn’t done yet, as you can see in the fourth row. The Ioniq is a hatchback, unlike the optima, and thus nearly doubles the amount of cargo space it offers. 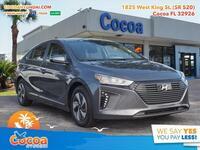 If you think the 2018 Hyundai Ioniq Hybrid is the best hybrid sedan option for you, be sure to get in touch with us here at Cocoa Hyundai. 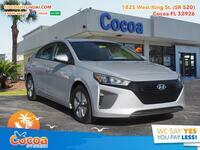 Interested in a Hyundai Ioniq Hybrid?